A breast cancer victim’s grieving family have been left devastated after heartless burglars stole the cash that their recently-buried mother had saved up for her headstone. The family, who do not wish to be identified, said they were “knocked for six” after the home of the cancer victim’s daughter was targeted in broad daylight last week. The incident is the latest in a string of burglaries in Larne and its surrounding areas. The woman’s grief-stricken relatives say they had previously thought things “couldn’t get any worse” after watching their beloved 83-year-old mother and grandmother succumb to breast cancer in November. “We are in shock, we are just heartbroken and devastated,” said the late woman’s grandson. “My granny died from breast cancer eight weeks ago and she had saved up £800 to put her name and picture on the existing headstone at the grave. “She wanted the family not to have to worry, she had paid for her own funeral six years ago. “It was her hard-earned cash which she had put away year after year. The late woman’s son added that he felt “physically sick” after discovering that his sister’s house had been ransacked. “We are only four or five days into the New Year and this happens, we are still getting over losing my mum,” he stated. “The people who did this are evil, they don’t care if it’s for funerals, they just want the money. “It’s sickening, they have no respect and they’re very reckless. “My sister has lived in that house for twenty years and it’s the first time anything like this has happened. “They either shouldered the door or kicked it in. “They went upstairs in the house and ransacked every room but left the downstairs looking like nothing had happened. “They just took the money upstairs, they even left a laptop downstairs. “They escaped by opening the back window and they would have had to go through our neighbours’ gardens to get away, but we knocked on doors and nobody saw them. The family say that they will ensure their grandmother’s picture and name are added to the gravestone as she wished, despite the callous theft. They are now urging other homeowners to “be vigilant” and to report any suspicious activity to the police. “There seems to be a spate of burglaries in and around Larne at the minute,” the late woman’s grandson continued. “They are getting very brazen and whatever measures are being taken at the moment are not deterring them. “We want to urge people to take care to be vigilant and watch out for anything suspicious, to keep their windows and doors shut and keep an eye out for anything suspicious. “It shouldn’t be happening more regularly and we hope these people will get caught. “They didn’t know what the money was for but people like that don’t care about anything. “They don’t see the effects of what they do, it’s not just about the house, the whole family is upset and the community feels insecure. A PSNI spokesperson stated: “At approximately 3.05pm on Thursday January 5, police received the report of a burglary at a residential premises on the Station Road area of Larne. “A sum of money was taken from the property. 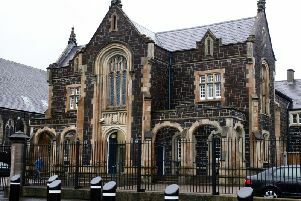 “Police are appealing to anyone that may have any information or to anyone that may have witnessed any suspicious activity in the area to contact Larne Police Station on the non-emergency number 101, quoting reference 630 on 05/01/17.